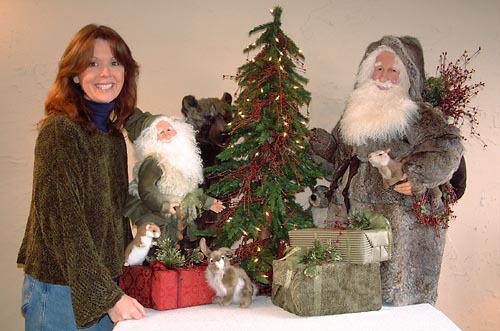 Beneath towering redwood trees that surround their home and “Santa’s Workshop” on Christmas Tree Hill in Northern California, Shelie and Richard McCall create their one-of-a-kind, collectable handcrafted Santas. Looking back over the last 35 years, it may not have completely been a coincidence when Shelie and Richard moved to Marin County and found a charming 19th century cottage that looked like something straight out of a story book. They knew the moment they walked in and looked out through the trees to San Francisco Bay, that they would make this enchanting place their new home. They had not yet found their calling to create magical and joy-filled Father Christmas’s. They simply fell in love with the beauty of the towering redwoods and lush surroundings and knew that within this new home, magic was going to take place. Over the next few years, they began to open a small chain of stores, featuring high-end plush animals, handmade dolls from around the world, and other types of exclusive collectibles. As lovers of vintage and handmade creations, the McCalls began hosting a yearly gala to showcase and share their love of these collectables. Each year, its success grew, with customers showing up hours before the event to get “first choice”. One year, it occurred to Shelie, who had always had a wonderful imagination and gift for sculpting and painting, that she should try her hand at making a Santa Claus figure for the show. It sold immediately, and customers asked for more. It was very exciting to know that her creations were appreciated by others. It was also the beginning of Stone Soup Santas. Within a few years, it became clear to the McCalls that they could turn their love of making the holidays joyous for others into a full time operation by making more handmade Santas. The first challenge was finding materials that measured up to their exacting standards. According to Shelie, “It was exciting to search for just the right fabrics, trims and stuffed creatures that we were going to need”. Now, with suppliers from around the country, the McCalls are able to use their creative vision and draw upon inspiration from days gone by to design a new line of Santa figures each year. 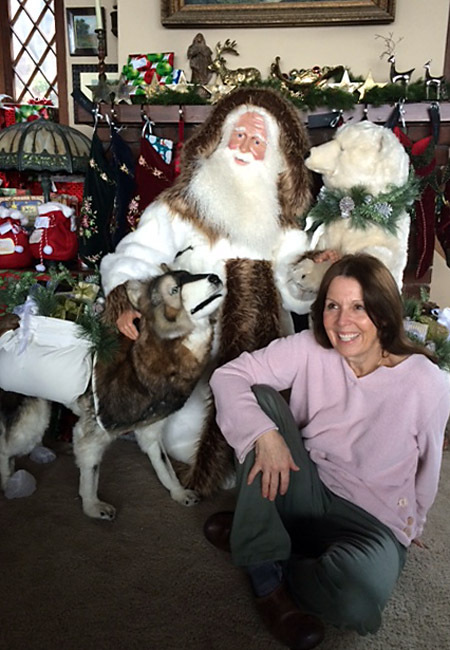 Every Santa is one-of-a-kind and signed by the artist, herself. According to Richard, “We feel very blessed to bring our love and celebration of Christmas into the homes of people from all walks of life and from every corner of the world”. “It is our firm belief that the miracle of Christmas, with the birth of Jesus Christ, is the most wonderful time of the year and should be celebrated with the kind of love that Jesus embodied. It is a time for reaching out to others with love and forgiveness, a time of joy and creating memories with our families, friends and extended community,” says Shelie. Whether you celebrate the birth of Christ at Christmas (Luke 2 :1-20) or the spirit of generosity and love…or both, we hope that our handmade Santas will fill your hearts with laughter and joy and create memories for you and your family for many years to come.